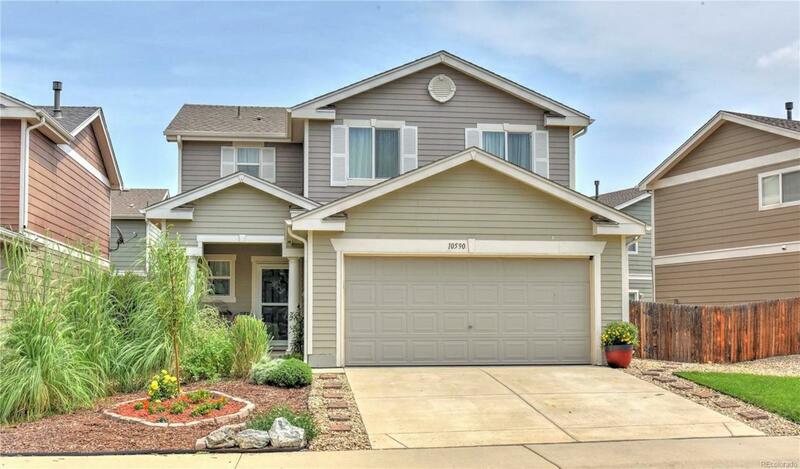 Beautiful 2 story home located in Idaho Creek featuring an open floor plan ideal for entertaining. The main level is complete with hardwood flooring throughout, family room at the entrance of the home, powder room, and laundry room off of the kitchen which boasts a pantry, center island, all appliances included, and access to the fully fenced backyard with patio and low maintenance landscaping. Upper level master bedroom with hardwood floors, walk-in closet, private full bath with double vanity, 2 additional bedrooms with carpet, and a second full bath. The home is within minutes to Blue Heron Reservoir with 604 acres of open land, trails, and lakes, as well as a neighborhood park, several restaurants, and easy access to I-25.